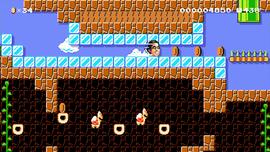 Dr Kawashima's Athletic Training is an Event Course in Super Mario Maker, released on December 20, 2016, and based upon the Brain Age franchise. It unlocks the Dr. Kawashima Mystery Mushroom costume upon completion. The level begins with some Hidden Blocks leading to some ? Blocks, along with a warp pipe. The next segment consists of conveyor belts, with Goombas and Spinies on tracks. After a brief segment with another Mystery Mushroom, the next segment consists of an area where Mario must jump on Koopa Paratroopas and ride some Donut Blocks to proceed. Mario must then slide on some Ice Blocks to the next warp pipe, where another Mystery Mushroom appears before the Warp Door. Afterwards, Mario must jump across block structures, then jump across some Bumpers to the Goal Pole. This page was last edited on March 30, 2019, at 02:22.